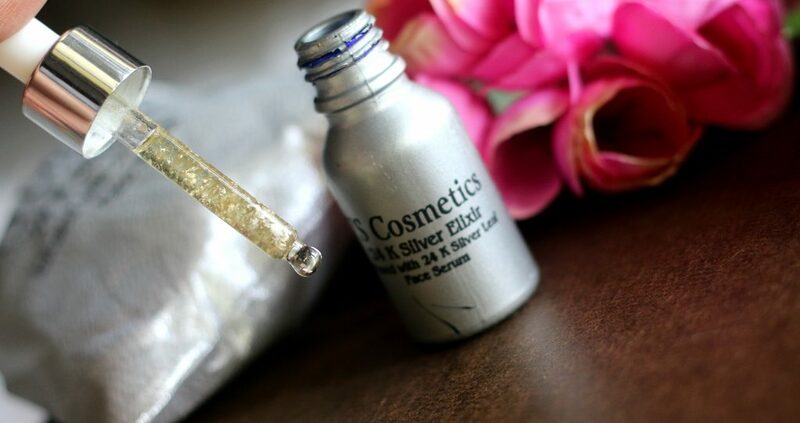 Open instagram or any e-commerce site or maybe a department physical store – You see shelves full of skin care products ‘hyped’ with exotic ingredients like charcoal and dead sea minerals and diamond/pearl. 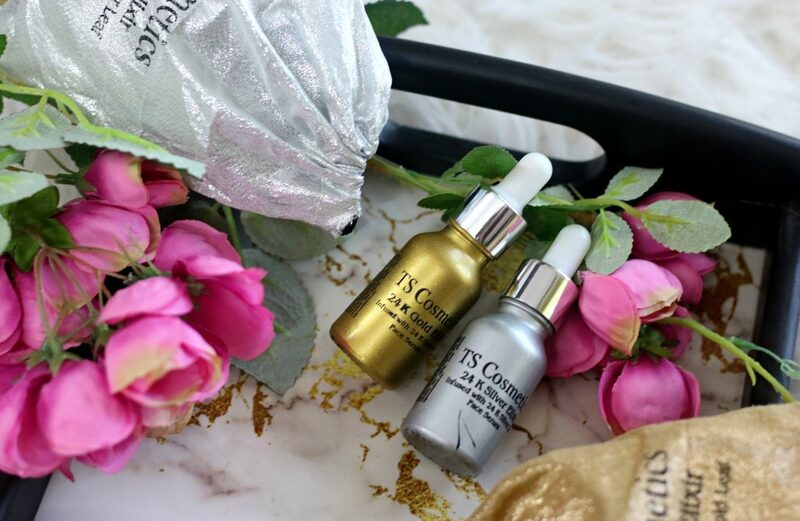 And recently, I started to notice a new trend – gold/silver infused skincare – From facial mists to creams to masks – Everything has gold infused to it. Now, another trending product that is ruling the market is facial oils. 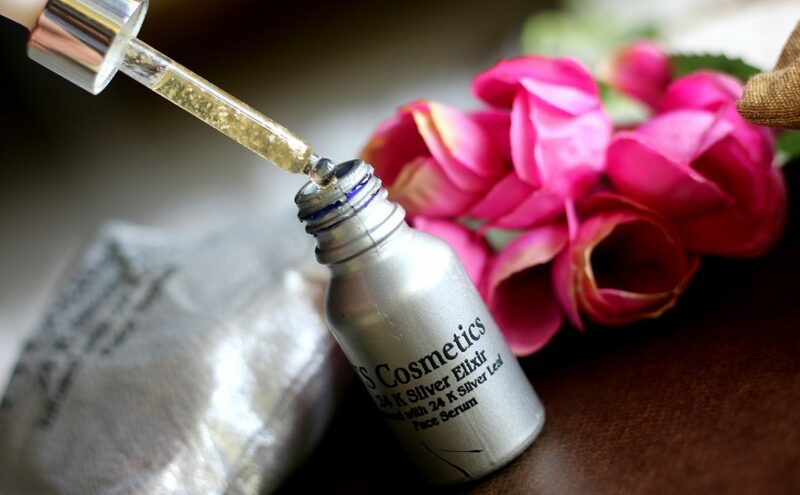 Facial Oils infused with medicinal herbs to gold/ silver is the biggest trend right now. What got me really excited about these facial oils are -They double up as a moisturiser, primer or help with blending the foundation etc. 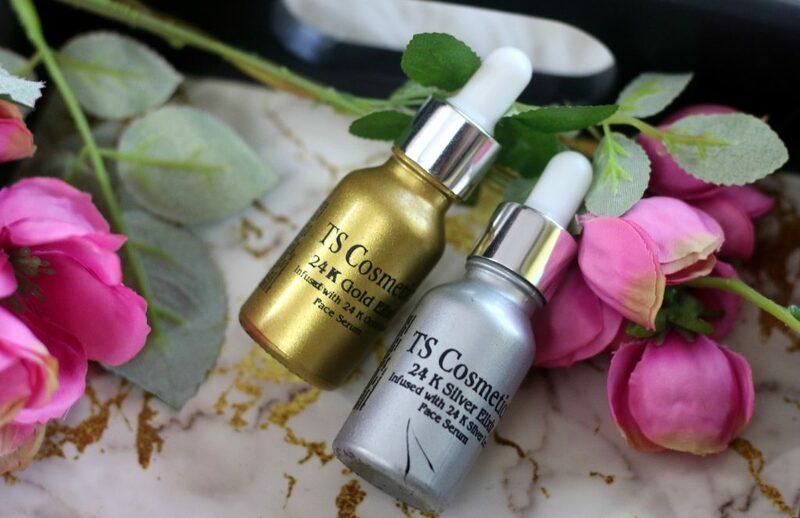 In today’s post – I am sharing my thoughts on two of facial elixirs from TS Cosmetics. I love anything that smells of oranges and I felt immediately in love with these when I took a sniff of its divine fragrance! I have a combination-sensitive skin type. This is how the beautiful package came in. 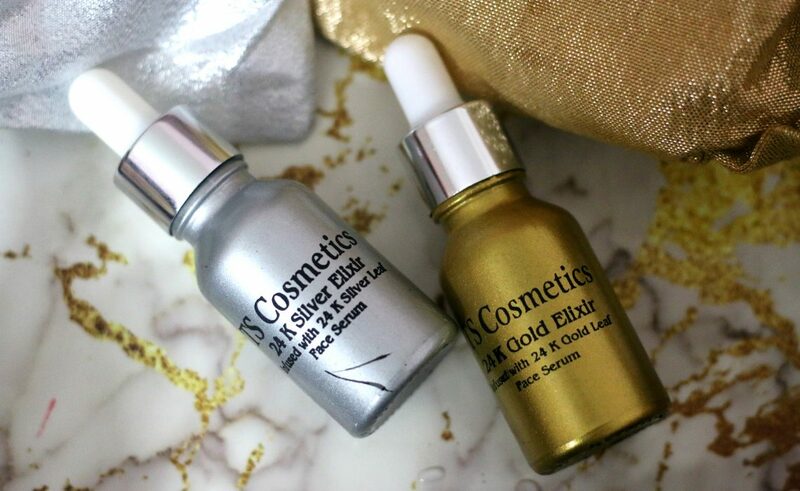 Silver and Gold Face Serums! 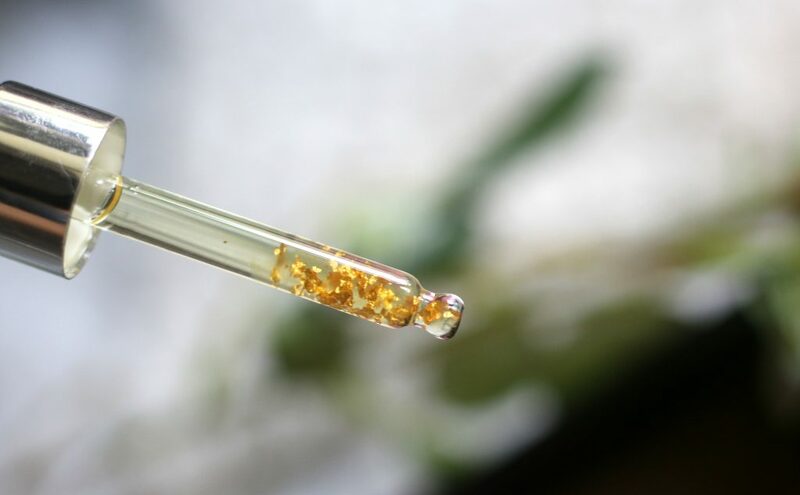 Enjoy the pictures of 24K Gold Leaf and Silver Leaf Elixirs. 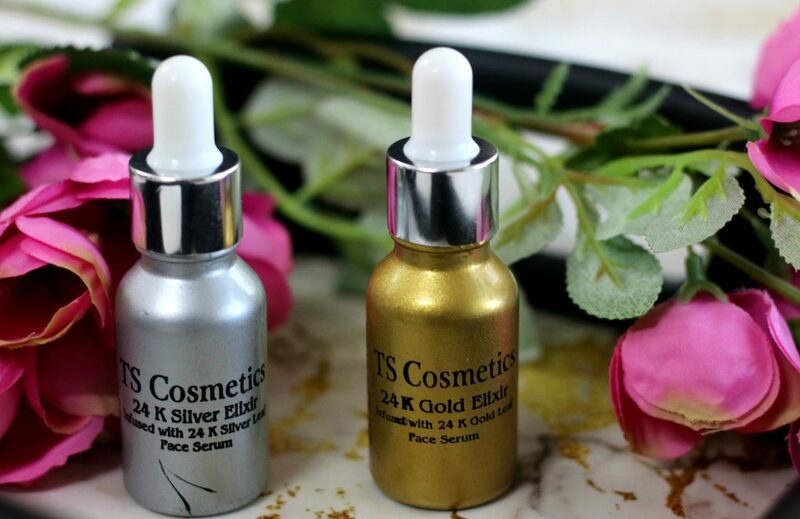 TS Cosmetics 24K Gold Elixir can be used by all skin types. It’s cruelty free as well. Super cute, Right ? And, look at those gold flakes! 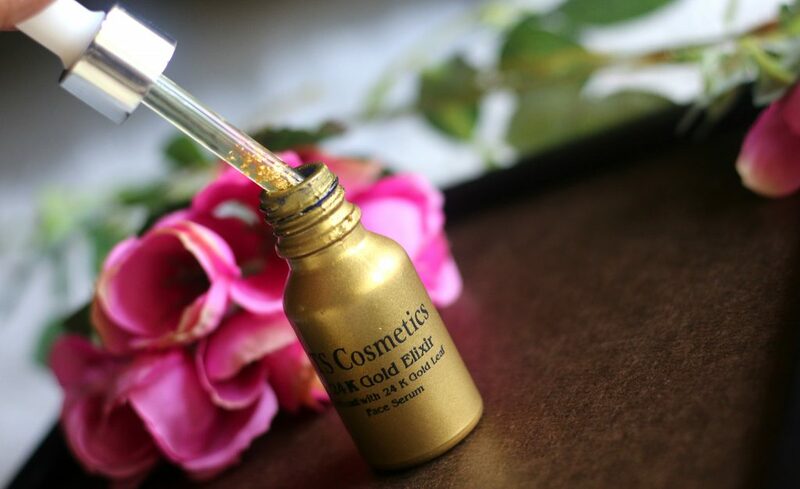 This 24K Gold Elixir helps to reduce wrinkles, fine lines, acne spots etc and it rejuvenates the skin cells. Did you notice the silver flakes ? 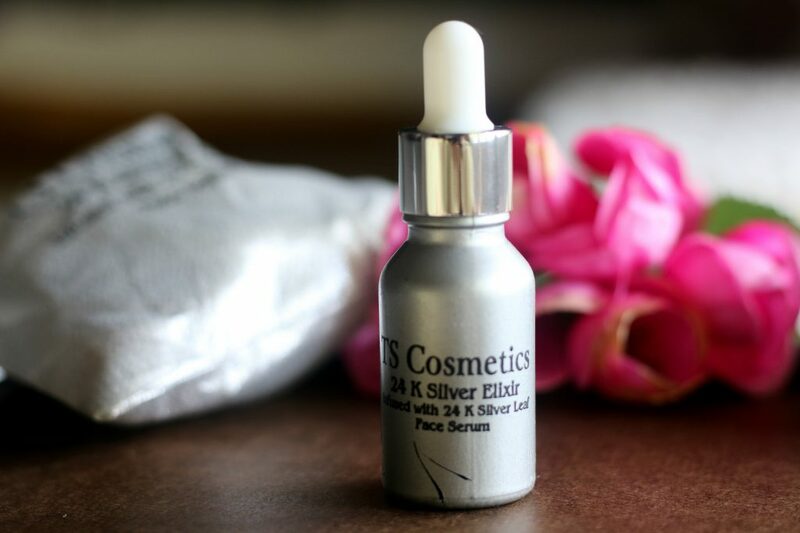 24K Silver Leaf, rosehip oil, jojoba oil, argan oil, grapeseed oil, apricot oil, vitamin e oil, vitamin c oil, chamomile seed oil, tea tree essential oil, orange essential oil, pumpkin oil, fragrance, lemon grass extract, orange peel extract, and some of the secret ingredients. Fragrance – It smells divine, smell of oranges… Luv it… It’s a non sticky sticky, non drying facial elixir that hydrates your face and neck. Glass dropper bottle makes it very convenient to use. As a lip treatment oil – A drop of it all over the lips prep and moisturize the lip area before applying any liquid lipstick or matte lipstick formula. It really hydrates lips without changing texture of your lipstick. Gives a smooth application and it prevents drying of lips. 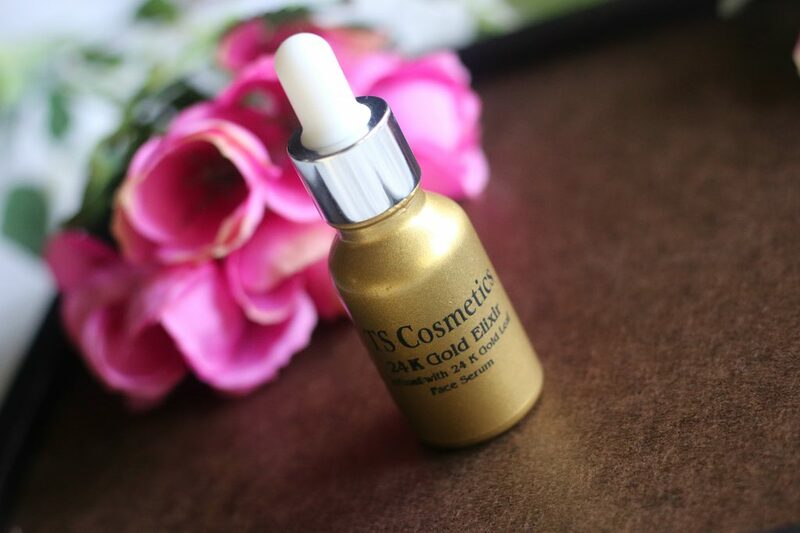 To Blend any makeup on your skin or for a smooth and perfect canvas for your foundation – Mix few drops of this magic elixir to your foundation and this helps blend your makeup like a magic. 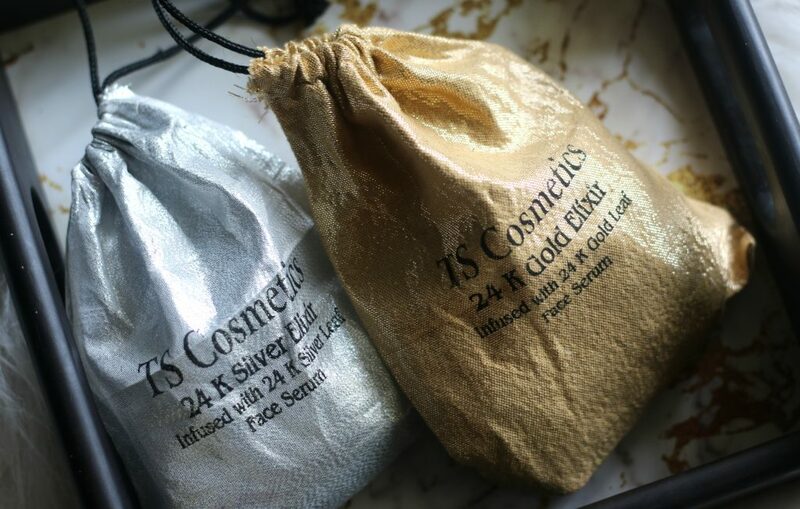 The pure 24k Gold/Silver flakes absorb right into your skin, leaving your skin glowing and naturally radiant. To Revive Dried Cream Products – Sometimes cream products can tend to dry out. Instead of throwing them away, just add 1-3 drops to your favorite cream concealer, contour, highlight, or brow pomade, to bring them back to life! As a Relaxing Facial massage oil – The notes of Lemon grass, orange peel, chamomile etc relaxes you after a tired day. This is my favorite way to use this elixir. Starting from the chin massaging in upward strokes gives you a very relaxed feel The citrusy scent is very soothing and is not at all over powering. As a Overnight facial oil/ Daily Moisturizer – Massage few drops on to your face directly or use it after your cleansing and toning and then follow with your favorite moisturiser. Wake up next day with a really rejuvenated and fresh face. it hydrates the facial area leaving the skin super smooth. These beauty elixirs are lightweight moisturizers with added anti-aging benefits (suitable for all skin types). Regular use keep your skin healthy and hydrated. Overall, they are quite good and my favorite is the Gold one. Love how light weight both serums/elixirs feel on my skin. It sinks into the skin super quick leaving a really natural glow. Consistency is runny with silver/gold flakes. I also love the non sticky nature of it. Also, it’s a blend of several essential oils along with some of the brand’s secret ingredients. On bad thing about them is – They haven’t mentioned the proportions of ingredients – Which I think is ok considering it as a unique formula. But, Atleast ,they’d have mentioned full ingredient list. Especially, essential oil blends are not for everyone. If all ingredients were mentioned, Atleast people’d know if that ingredient suits their skin or whether they are allergic to a certain ingredient etc. Fr eg: I am allergic to sandalwood. I recommend everyone to do a patch test before trying directly on skin. Also, I recommend you to leave under eye area. Only apply on face and neck leaving eye area. I like the fact that it’s easily available and is a great alternative to the much raved about Farsali Oils. if you don’t like citrsuy/orange notes – I suggest you stay away from this. It clearly does smell of oranges or has citrusy notes to it. These awesome beauty oil nourishes the skin and seals in the moisture, leaving your face soft, radiant and healthy looking. 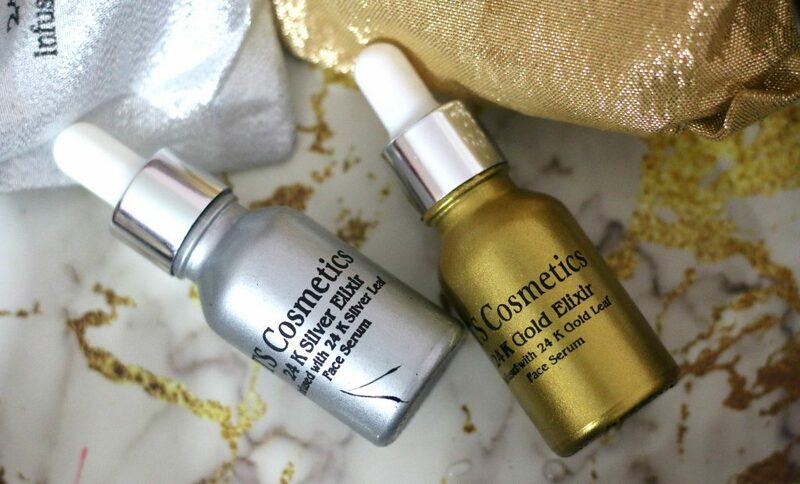 Formulated with 24K Gold/ Silver, Regular use visibly brighten and hydrates skin. To Buy the products – Visit their Instagram page here and message them to place your order. 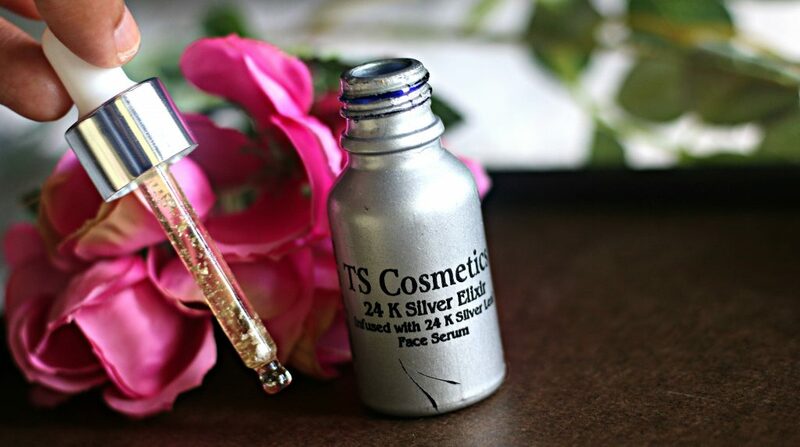 Have you tried TS Cosmetics 24K Gold/Silver Face Serums/Elixirs ? What’s your opinion on them ? I have tried their glitters and eye lashes.. Was planning to try these as well… But was not sure about them.. Now I know.. I am very much intrigued to see these elixirs on your blog. These look amazing Renji. Looks interesting, no product I have ever seen has gold or silver flakes in them. They just claim to have gold and silver content with no visible proof. This looks genuine and it can be used, mixed in plenty of things. I think I will try this.